The ideal Castille-La Mancha Pools are located mainly in big cities, but it's also painless to locate public pools in rural areas. Not all countries are the same, and swimming rules and regulations are changing from one country to the other. So, if this is your initial time seeking for Castille-La Mancha Pools, be sure you call the premises before you drop by. 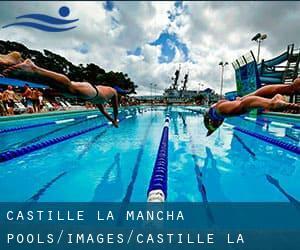 The best selection throughout your visit to Castille-La Mancha are going to be droping by a Castille-La Mancha Pool. For Castille-La Mancha and its vicinity, we're showing you all of the registered pools, some of them have no GPS coordinates and can't be found on the map at the map. Do you know of any Pools in Castille-La Mancha that should be listed here? Contact us!. Please use the contact knowledge provided at every pool profile to check if they are offering aquagym lessons, mainly because is not so common to determine an Aquagym in Castille-La Mancha. There are various reasons why you should choose a heated swimming pool in Castille-La Mancha. The most crucial one relies on the importance of keeping the body temperature stable. If the water is too cold, your body will try to warm it up and you will lose strength to swim properly. Enjoy the best indoor pools in Castille-La Mancha and don't worry about the weather. These facilities are open all seasons and you can enjoy a swim at the same temperature every day of the year. If you're tired of getting eyes and irritated skin, acquiring a saltwater pool in Castille-La Mancha is often the resolution. You'll want to know that the level of salt from these pools is well below the level of salt from sea water, specifically they are talking about a tenth or less. There are many alternative treatment options to chlorination, with superb advantages that ensure superior water top quality in the pool. One possibility may be the mineralizer, which purifies water naturally and significantly decreases the chemicals used and maintenance time. Try Chlorine Cost-free pools in Castille-La Mancha. One of the advantages of outdoor swimming in Castille-La Mancha may be the possibility to sunbathe throughout the summer season. Taking it with extra care, sunbathing is healthy given that introduces Vitamin D into the body, so the most effective option seems to be switching between indoor and outdoor pools depending on the season. It's difficult to visit Castille-La Mancha without dropping by Talavera de la Reina (with 88.856 residents). Currently Swimia is showing you all the Swimming Pool in Talavera de la Reina and also the closest pools located in its vicinity. Without a shadow of a doubt, swimming in Ciudad Real is the best way to unwind right after perform. Take a couple of minutes to browse Swimia's catalog to find a Swimming Pool in Ciudad Real. Whereas Cuenca is among the six most populous cities in Castille-La Mancha with nearly 55.866 residents, you shouldn't miss that one if you're going to Castille-La Mancha. Let us tell you a secret to switch off while you might be in Albacete: just choose a Swimming Pool in Albacete and plunge into the water! There's no additional effective process. Holding an estimated population of 82.291, Toledo is one of the most important cities in Castille-La Mancha. Check all the Swimming Pool in Toledo and its surrounding area. Swimming is a excellent thought to keep your body active during your visit to Guadalajara (Castille-La Mancha), or perhaps if you are a local. Swimia helps you to find your closest Swimming Pool in Guadalajara. Updated on 2019 Calle de La Paz, 6 , Albacete , Spain (Postal Code: 02006). This sports center offers 25 meters, 8 lanes, Indoor/Outdoor. For this Swimming Pool, only phone number is number here. Updated on 2019 AVD. JUAN CARLOS I, 10 10ºC 45600 - TALAVERA DE LA REINA (TOLEDO) , . Updated on 2019 Calle Jorge Juan s/n , Albacete , Spain (Postal Code: 02006). Swimmers like you reported 25 meters, 8 lanes, Indoor/Outdoor. Unfortunately we do not have the email address of this Swimming Pool, but we can give you the phone number. Updated on 2019 AV. NIORT, S/N - PISCINA CUBIERTA 13700 - TOMELLOSO (CIUDAD REAL) , . Updated on 2019 ESPERANZA, 1 - 2º B 13300 - VALDEPEÑAS (CIUDAD REAL) , . Updated on 2019 ALFARERIAS BAJAS, 2 02600 - VILLARROBLEDO (ALBACETE) , . Updated on 2019 ANEGA, 21 13200 - MANZANARES (CIUDAD REAL) , . Updated on 2019 MELILLA, 21 02001 (ALBACETE) , . Updated on 2019 Avenida España 65 , Albacete , Spain (Postal Code: 02006). Swimmers like you have reported 25 meters, 6 lanes, Indoors. Also, you will find 25 meters, 7 lanes, Indoor/Outdoor. Just in case you want to contact this Swimming Pool before dropping by, we only know the phone number. Updated on 2019 Calle Andalucía, 11 (45005) Toledo.. Updated on 2019 EJERCITO, 26 02002 - ALBACETE , . Updated on 2019 AVD. DE ESPAÑA, 19 BAJO - ORTOPEDIA 02002 (ALBACETE) , .